I knew my 1979 Jeep Cherokee Golden Eagle was cool, but it took finding this original AMC window sticker for me to appreciate the extent of my latest project’s awesomeness. 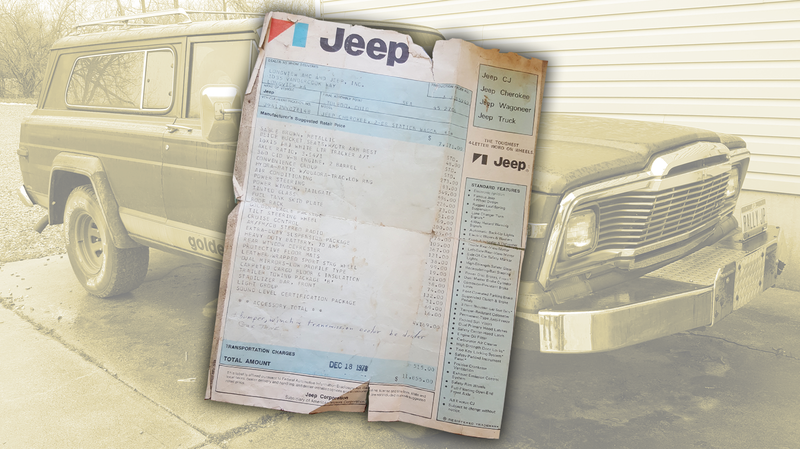 Just look at how this old Jeep was originally configured when it was sold in December of 1978. It’s the original window sticker from 1978! And after reading through the magnificent document (along with some sales literature from back then), I’ve learned that my Jeep—outfitted with a smorgasbord of optional equipment—was pretty hot stuff back in the late 1970s. That optional equipment includes a $273 360 cubic-inch V8 (instead of the 258 cubic-inch inline-six); a $549 tough-as-nails TH400 “Hydra-Matic” automatic transmission with Quadra-Trac full-time four-wheel drive and low range (instead of the four-speed manual); a $69 fuel tank skid plate; a $38 heavy duty battery; a $121 “extra-heavy duty” suspension package; a $132 trailer towing package; a $31 front sway bar; a $74 carpeted cargo area; $19 protective floor mats; as well as an aftermarket bumper, winch and transmission cooler that were likely installed at the dealer (the winch is missing from my Jeep). This SUV came from the factory built to withstand anything short of a nuclear blast. As far as interior comfort and aesthetics, the Jeep came with beige cloth bucket seats with a center console (costing $48 in total), a $596 air conditioning system, a $223 power steering setup, $73 power windows, $51 tinted glass, a $100 roof rack, a $76 tilt steering wheel, $105 cruise control, a $367 AM/FM/CB radio, $99 rear window defrosters, a $21 leather wrapped steering wheel, $38 low-profile mirrors, a $69 light group (which added lights in: the glove box, ash tray, engine compartment, headliner, vanity mirror), and a $83 convenience group (which added: an electric clock, a headlight buzzer and intermittent wipers). The price of the Golden Eagle graphics package is hard to make out, as there’s a little tear in the paper. But using a fancy trick called “algebra,” I deduced that it cost $895—that may sound like a lot, but come on, just look at it; the Golden Eagle package is totally worth it. The total amount, dated Dec. 18, 1978, is a whopping $11,855. I say “whopping,” because if I use the Bureau of Labor Statistic’s CPI Inflation Calculator, I find that this price equates to approximately $43,404 in today’s money—or about the cost of a four-door Jeep Wrangler JL Rubicon. Without options, though, the SJ Cherokee is extremely basic. One of my favorite parts of the window sticker is the section on the right, which shows hilariously primitive standard features like: “rugged leaf-spring suspension,” and “4-way hazard warning signals,” as well as “automatic back-up lights...recirculating-ball steering...engine oil filter ...carburetor air cleaner” and “positive crankcase ventilation.” Clearly, AMC just needed something to put on that sticker, so they mentioned a bunch of mundane stuff (to be fair, modern automakers do the same). I’m lucky to have found any Jeep SJ in such good shape up near Michigan; the fact that this one is so well-equipped is just icing on the cake. And the fact that I have the window sticker to go along with it somehow makes it even more awesome. My plan from here: put that piece of paper somewhere safe, and begin wrenching and cleaning what is—by an enormous margin—the nicest vehicle in my fleet.